A lovely park in Rockhampton not far from the Catholic Church. We bought some good fish and chips from a shop near by and ate them at one of the tables provided with a large shady tree, being winter in 2017 and rather warm there was hardly anyone around just a view birds. The fountain looks lovely and inviting to put ones toes in. Nice to see the ibises feeding on the lawn. These were a lot more scattered about looking for a bit of fish and chips to eat.. They are rather large compared to some. Oh well, different places have different birds even if it's a similar climate. Beautiful area.. which bird are those? they are quite big!!! Esas aves quisieron acompañarte en la comida, para que no te encontraras tan solitaria. A pesar de que mi tierra es calurosa, en invierno suele hacer frío. 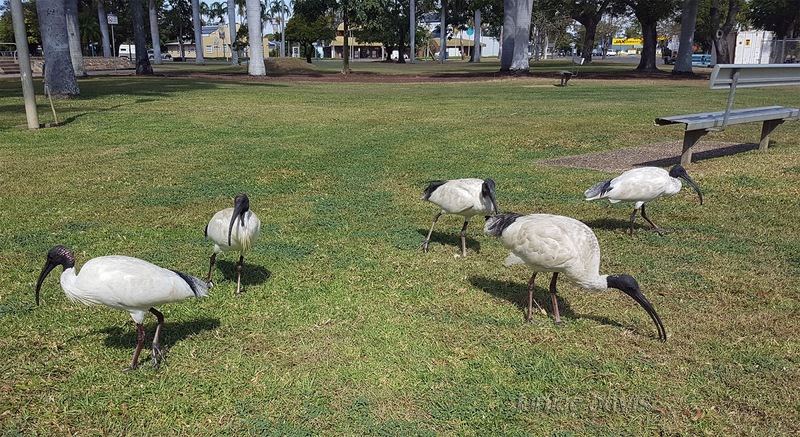 The Ibises usually come for a feed thinking they may get something to eat, they usually do. The bin chickens look very large in Rockhampton. 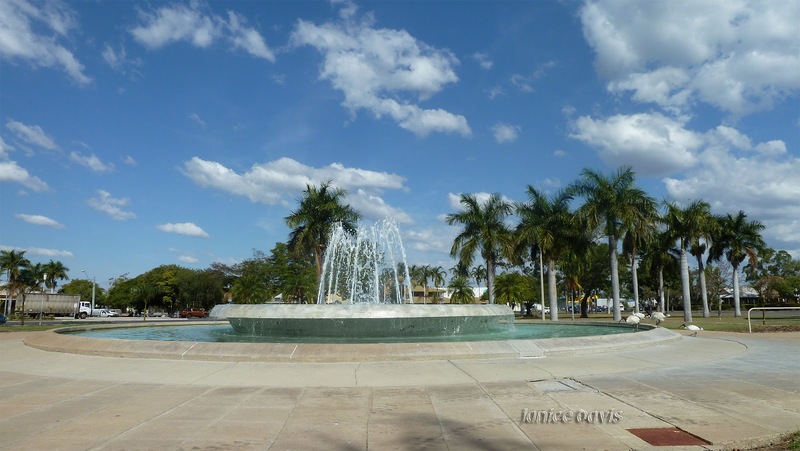 I would describe the fountain as a Municipal fountain, that is one put in by local government in a prominent civic area. Nevertheless, always good to see fountains. I've never seen ibises! They are beautiful! Thanks re photos and the week. It was a nice day for a picnic. Indeed it was as most of the days that we stayed in Rockhampton . That is a lovely fountain. We had never visited that park until 2017 and that's when we came across that lovely fountain. fish and chips with no marauding seagulls? That's new. The park and fountain are lovely. I love the Ibis, beautiful. The scene reminds me so much of my vacations in Florida. The Ibis know a good spot to be - near the Fish and Chip shop. I haven't had bought fish and chips for years, and we have the shop that won best Fish and Chip shop in the country in our town, must give them a try. When the Greeks migrated to Australia many of them opened a fish n chip shop and always made wonderful fish n chips, then they the Greeks children didn't necessarily follow in their parents footsteps so you hardly see any Greeks these days owning fish n chip shops. We go without that meal for ages then we get a fad on them. I hope you refrained from feeding those damn scavenger birds! I absolutely detest them like the Indian Mynah 'murderous" birds. the Capricorn Coastline do have excellent fish dishes and the "fish and chips"
shops are pretty good also. Someone has to eat the rubbish and we only gave them those very small chips that are left in the bottom of chips. We had my favourite - Barramundi of course, and I know it's not yours. Hope your cold is soon better, nasty this time of year but then nasty anytime of year. The are, something to look at.